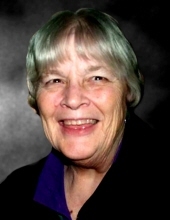 Sandy Ann Grice, 72 of Sanford, passed away peacefully at home on Monday, April 15, 2019. She was born March 10, 1947 in Midland, daughter of the late Earl and Betty (Clark) Beebe. Sandy grew up and attended school in Midland County and was part of the second graduating class of Meridian High School in 1965. On August 28, 1965, she married Tracy “Buck” Grice. Sandy worked as a waitress for many years until opening her own consignment store, Sandora’s Nice As New. She was co-owner and operator for 10 years until her retirement in 2000. Sandy’s love of retail did not end with her retirement. Every summer the neighborhood could look forward to her annual rummage sale. Sandy was a very energetic woman who enjoyed dancing, fishing, and playing fast pitch softball, even getting to play a season on the same team as her daughter. She had great faith and was an active member of her church community. She also enjoyed working with children and held Bible camps at her house. Sandy took great pleasure in being around people but nothing gave her greater joy than being with her friends and family. She is survived by her husband Tracy “Buck” Grice; son Mark (Holly) Grice; daughter Wendy Reese; and grandchildren Tana Reese, Cody (Jessie) Reese, Alyssa Grice and Maticka Grice. Sandy is also survived by her brothers Earl Beebe, Mike Beebe, and Kevin Beebe as well as many nieces, nephews, and special friends. In addition to her parents, she was preceded in death by two brothers Lonny Beebe and Rod Beebe, and her twin sister Sandra Duel. Memorial services for Sandy will take place at 11 a.m. Tuesday, April 23, 2019 from Billings Bible Church, 4077 Wieman Road, Beaverton. Her family will receive friends at the church on Tuesday from 10 a.m. until the time of service. Those planning an expression of sympathy are asked to consider the Pardee Cancer Treatment Fund. Cremation arrangements have been entrusted to the care of the Ware-Smith-Woolever Funeral Directors. To plant a tree in memory of Sandy Ann Grice, please visit our Tribute Store. "Email Address" would like to share the life celebration of Sandy Ann Grice. Click on the "link" to go to share a favorite memory or leave a condolence message for the family.